What follows is a press release from Academia Sinica’s Institute of Astronomy & Astrophysics, regarding the new Mandarin Galaxy Zoo. Below is some context for English speakers and regular Galaxy Zoo users. Last weekend, led by Dr. Meg Schwamb (who is part of the Planet Hunters and Planet Four teams), a team of Taiwanese astronomers helped introduced a Chinese (Mandarin) version a Galaxy Zoo to the public on the Open House Day of Academia Sinica, the highest academic institution in Taiwan. A big crowd of enthusiastic students and parents, attracted by the long queue itself, visited the ‘Citizen Science: Galaxy Zoo’ booth to try the project hands-on by doing galaxy classifications. They were excited to participate in scientific research and enjoyed it very much. The Education Public Outreach team of Academia Sinica’s Institute of Astronomy & Astrophysics (a.k.a. 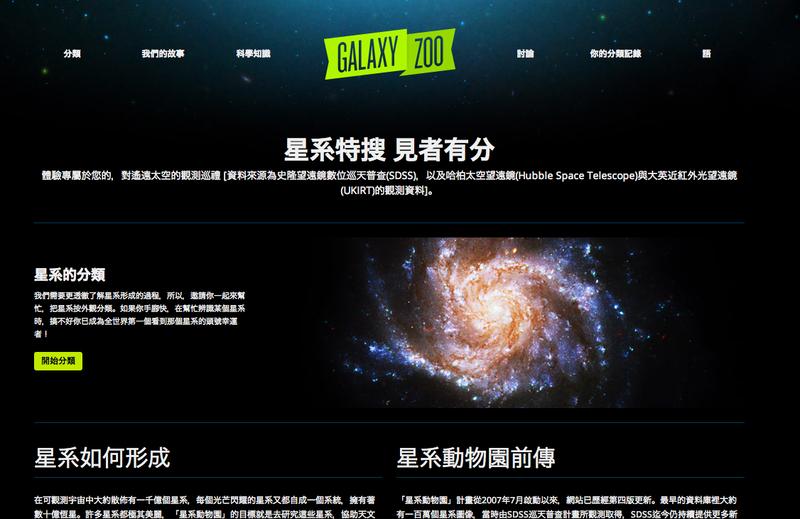 “ASIAA”), has helped translated Galaxy Zoo from English to Chinese (Mandarin). The main translator, Lauren Huang said, “we were keen to do a localized version for Galaxy Zoo since 2010, so when Meg brought up this nice idea again, we acted upon it at once.” In less than six weeks, it was done. The other translator, Chun-Hui, Yang, who contributed to the translation, said that she likes the website’s sleek design very much. “I think the honor is ours, to take part in such a well-designed global team work!” Lauren said. Talking about the translation process process, Lauren provided an anecdote that she thought about giving “zoo” a very local name, such as “Daguanyuan” (“Grand View Garden”), a term with authentic Chinese cultural flavour, and is from classic Chinese novel Dream of the Red Chamber. She said, “because, my personal experience in browsing the Galaxy Zoo website has been very much just like the character Ganny Liu in the classics novel. Imagine, if one flew into the virtual image database of the universe, which contains all sorts of hidden treasures waiting to be explored, what a privilege, and how little we can offer, to help on such a grandeur design?” However, the zoo is still translated as “Dungwuyuan”, literally, just as “zoo “. Because that’s what some Chinese bloggers have already accustomed to, creating a different term might just be too confusing. GZ has had the third language:Chinese(traditional)(繁體中文)at last,but I think we’d better have Simplified Chinese(简体中文)for more volunteers in China.The development in Chinese mainland is the bread-and-butter thing. Then,some of the translations might not be the best such as ‘什麼是盤面'(Disk)’什麼是棒狀'(Bar),better as ‘盘状结构’,’棒状结构’.